Wooden railway sets are a classic toy that children love to play with. 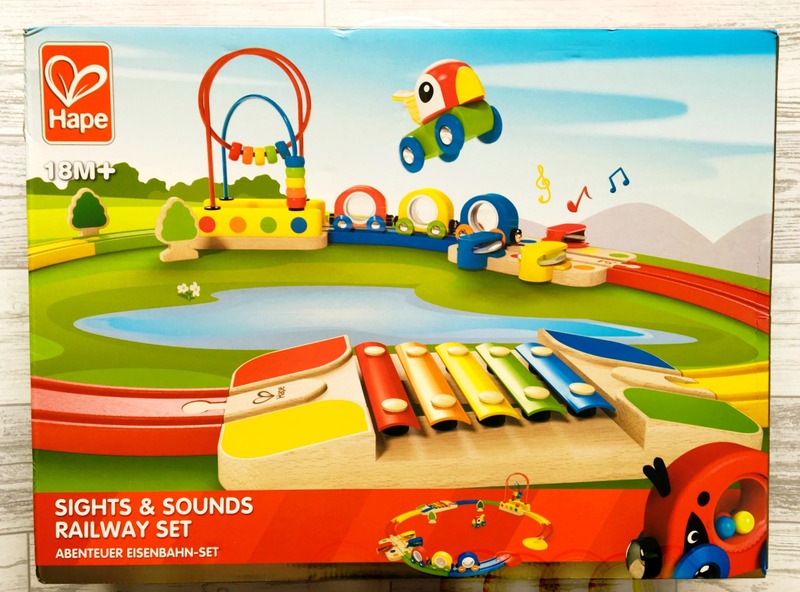 The Hape Sights and Sounds Railway Set is a fantastic wooden railway set with a musical twist. 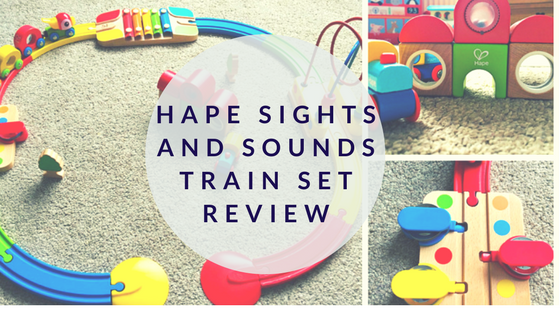 The Hape Sights and Sounds Railway Set is perfect for younger children, age 18 months plus. It is bright and colourful and really engages them. It is perfectly suited to a toddlers attention spans. The railway set is made up of 19 pieces. Three of them are music related, there are two trees, a train which is made up of three carriages and the front of the train – which doubles up as a whistle. Perfect for blowing before the train sets off on its travels. 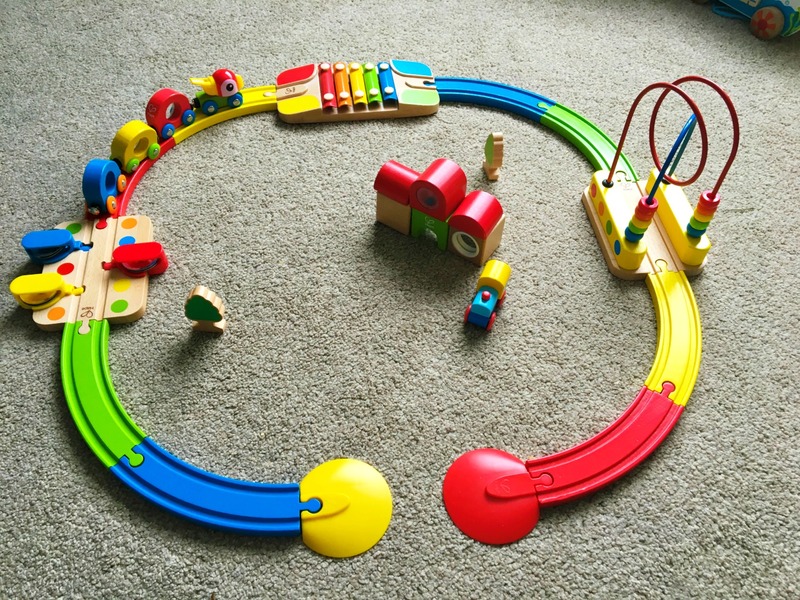 The music elements of the train set gives toddlers the opportunity to explore their creativity whilst using their imagination playing with the trains. When the train goes over the xylophone and the little cymbals they make a noise. The other item has beads that can be moved from one side to another. J loves playing with this. The train carriages all have different things to engage with, their is a mirror, rattles and the front of the train is a whistle. 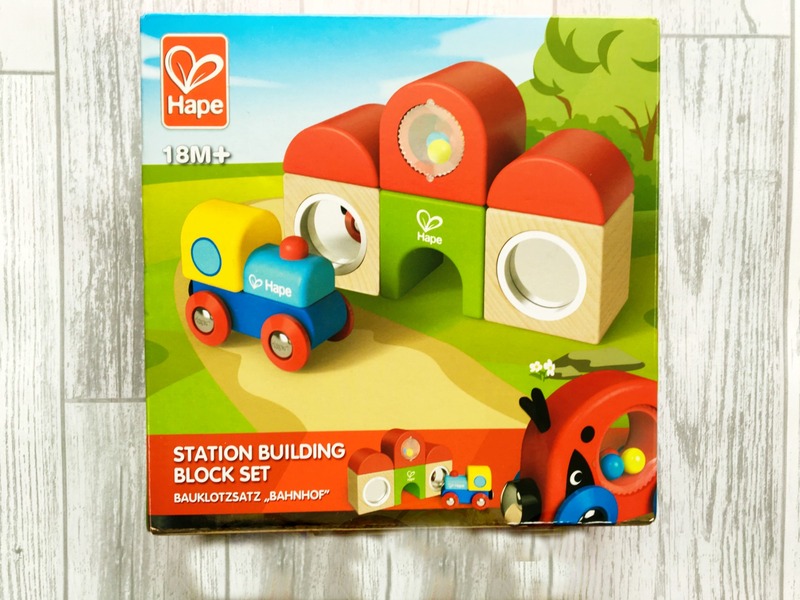 The Hape Station Building Block set which can be purchased separately is a great addition to the set. It comes with another little train and some blocks to build the station. The blocks also have mirrors and rattles to help keep the children engaged for longer. We placed the set in the middle of the track and it looks great with the Hape Sights and Sounds Railway Set. J enjoys playing with the set, thanks to his big sister he has figured out what to do. When we first set the track up for him he was fascinated with all the musical aspects and kept running the small train over them. He was especially drawn to the xylophone. J will quite happily pull the track apart and then just play with the bead toy and play with the instruments pieces. 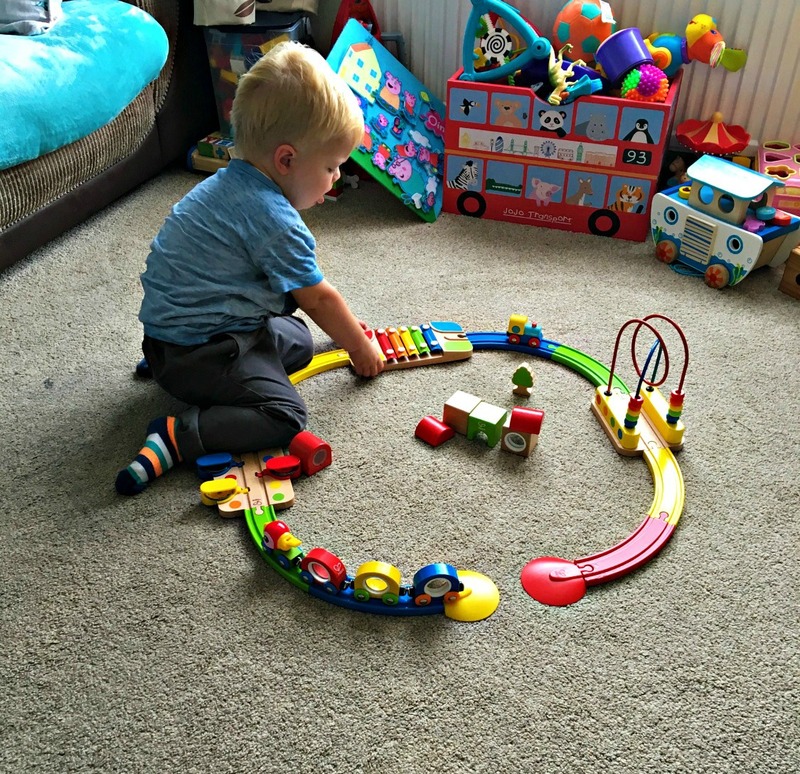 We all love this trainset, its great fun and J loves it. E enjoys playing with the set with him too. You can purchase the Hape Sights and Sounds Railways Set at Amazon £54.95 – the price fluctuates with Amazon. You can buy the Hape Station Building Block Set from Debenhams for £10. 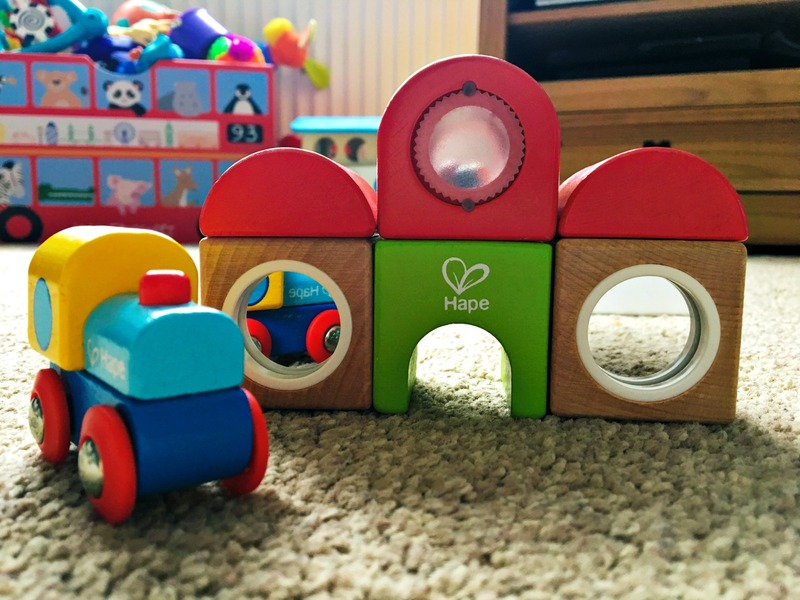 Both the Hape Sights and Sounds Railway Set and the Hape Station Building Block set are great toys. J gets a lot of enjoyment from them. I tried to film J using the set, however he was moving around too quickly so I got his big sister E to show us the set. 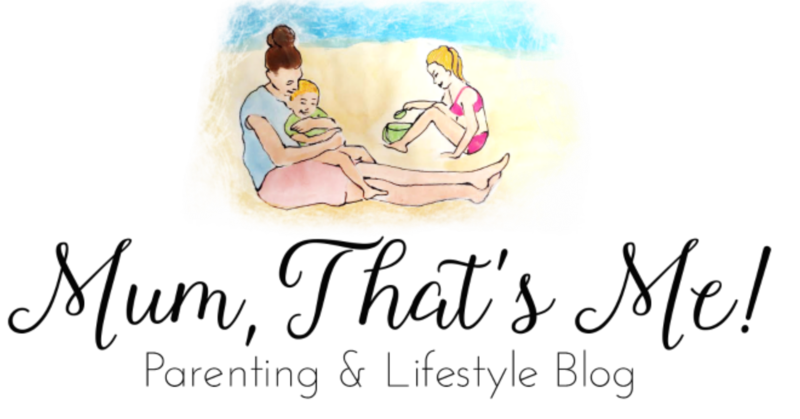 Disclaimer – We were sent the above items to review. All words and opinions are our own. That looks like a lovely toy and not too bulky as it can be packed away. Oh this takes me back. One of my twins was an absolutely Thomas and train set fiend. He would play happily for hours alone with his trains. This is a beautiful set, perfect for little hands.